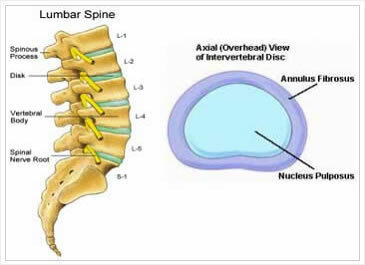 The discs are gel like pads that separate the vertebral bodies of your spine. If provides stability, range of motion and most importantly, they act as shock absorbers. Certain conditions can create changes in the internal structure of the disc creating a painful condition. The source of the pain can be the disc itself, ligaments surrounding the spinal canal or nerves (being irritated by a herniated disc or a tear on the disc). Pain can be referred to your arms, legs, and neck and back, hips, abdomen and chest wall. Other structures such as muscles, joints and ligaments in your spine, along with internal organs, can produce similar symptoms. What Is Discography and What Are the Indications? Sometimes, in spite of diagnostic tests such as MRI, CT Scan and Myelogram, the source of the pain remains unknown. Discography is a minimally invasive test, designed to confirm whether the intervertebral disc is the source of the pain. Studies have demonstrated that the presence or absence of a herniated or degenerative disc, do not correlate with pain in a significant number of patients. In these specific situations, discography is useful not only in identifying the source of pain, but it will help the surgeon or interventional pain medicine specialist plan the correct treatment. The procedure can be performed as an outpatient, in the office, hospital or out patient surgical facility. Usually the procedure is performed under local anesthetic with intravenous sedation, in order to facilitate relaxation and assist in comfort. Also an intravenous antibiotic will be administered prior to the procedure. You will be taken to the procedure suite, place in the fluoroscopy bed lying on your stomach. Blood pressure and cardiac monitors will be applied. Next, the skin overlying the respective discs will be cleansed with special solutions, sterilizing the local. Then a solution of local anesthetic (numbing medication) is infiltrated in the skin and deeper tissues overlying the discs. Under fluoroscopic guidance (X-ray machine), a special needle is inserted into the respective disc. You may feel temporary discomfort during this time. Once the needle(s) are in the proper position, a small amount of contrast will be injected into the disc. Your doctor will ask you to describe what you feel as the dye is being injected. During this time, you will communicate as accurately as possible, your experience. If discomfort is reproduced at the usual location, your physician will then ask you to describe the intensity, in a scale from 1-10. The procedure usually takes around 20-30 minutes, according to the number of discs being evaluated. The procedure usually takes 30 minutes. You will go back to the post anesthesia care unit (if you received intravenous sedation), where you will be monitored for 30-60 minutes according to your response. Post procedure instructions will be given in a pre-printed form. A follow up appointment will be made for post procedure evaluation in approximately one week. Medications will be given post procedure to assist in managing any discomfort. The post procedure discomfort is usually minor and can be manage with ice packs and medications. If no intravenous sedation is planned, you continue with your usual dietary habits the day of the procedure. If intravenous sedation is planned, avoid eating any king of solid foods prior to the procedure and you may have clear liquids up to 4 hours prior to the procedure. If you are taking Coumadin, Heparin, Plavix or non-steroidal anti-inflamatories (such as aspirin, ketoprofen, naproxen or others), stop taking them at least one week prior to the procedure. If you are diabetic and planning on having IV sedation, our office will give you specific instructions. The decision to return to work after the procedure will be made on an individual basis considering medical necessity and your specific condition.